To save money at a warehouse club, you have to shop at the type of warehouse club that fits your family’s needs. Some clubs are geared more toward small businesses and that type of club eventually did not work for us. BJ’s has more items packaged in more manageable sizes for families which would save my small family money if I shopped this type of wholesale club. To save money at a warehouse club, may depend upon what kind of shopper you are. If you compare the unit prices can save money. If you buy the largest size possible thinking it automatically is a deal like I used to, you might not (unless you have a big family and need large size no matter what.) I’m more savvy about unit prices than I was when we had a membership and used that to my advantage. To save money at a warehouse club, may depend upon family size, circumstances, preferences, and location. Due to family life, our needs, quantities, and purchases change. For example, the way we are blowing through coffee with Husband and I telecommuting full time I’d buy a BJ’s membership for price the coffee alone if the nearest store wasn’t 2 hours away from my house. Take a look at the right side of the photo below. BJ’s sells two pounds of Kona coffee for $13.99. The same amount of Kona coffee is $28.47 at World Market. If organic is your thing BJ’s sells 2 pounds of organic coffee for $12.99 compared to the same amount of non organic coffee at Trader Joes. BJ’s coffees are sustainably raised and the workers and growers are paid a fair wage for their efforts but the coffee is not not certified Fair Trade because they don’t want to pass the high cost of certification onto their customers. I’m OK with this. You might not be and that’s OK. To each their own. While I would save a ton on coffee, I might lose money buying meat and perishables. I have a small freezer that burns everything so we can’t take advantage of the good prices. 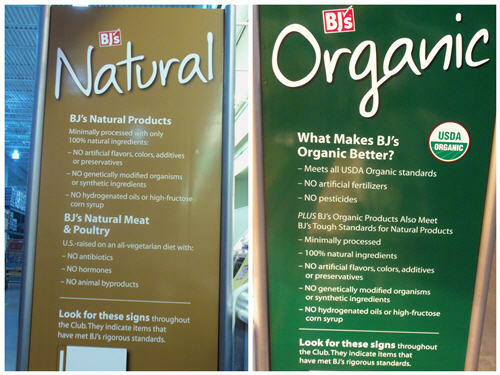 Pity because BJ’s definition of Natural and Organic is in line with my own. Photo courtesy of little ‘ol me and my food blog Lazy Budget Chef. To save money at a warehouse club, may depend upon seasonal shopping. For every person who says not to shop the center section of the store, there is another who says there are bargains. I found this to be true. I made a few smart purchases when I went to a BJ’s Back to School event a few years ago but I wasn’t going to save money on most of the items in the center seasonal section of the store at that time because my kid is a dog. However, this trip I found several deals in the same center section I want to buy for Christmas. For example, our hosts pointed out several examples that if you broke a gift basket up like the Belgian Dark Chocolate Thins or the Mugs filled with Lindt truffles you spend $5 per teacher/gift exchange/etc. gift. See that Genesis Soda stream in the lower right hand corner? BJ’s sells it and several flavors for $79.99. SodaStream sells the same thing for $169.99 on their website. My stainless steel pots and pans were a Christmas seasonal purchase from a warehouse club and are going strong 10+ years later. I know gift cards are kind of a cop out gift but in my defense, a big chunk of The Ten are tweens and teens who are hard to buy for and like getting gift cards. Not to mention, how inexpensively it makes sending a useful gift to out of state family. Were there so not so budget saving for a small family temptations for sale? Yes. Just like every other store I shop. They weren’t on my shopping list but I treated myself to a pair of yoga pants because my current pairs have a serious case of saggy seat. This is what I bought for $120 at BJ’s Wholesale Club. I adjusted the dollar mount minus some items not pictured because it will spoil holiday surprises. Wild Brown Rice – same price. This is something we normally buy and doesn’t go on sale at any of the stores we shop. I also want the jar for a future project. Baking soda – Deal. I use baking soda for cleaning and go through a ton so it makes sense for me to buy a large bag of baking soda after doing the math on my phone and seeing that it is cheaper than buying it by the box at Aldi. Your mileage may vary. Store brand Allergy tablets, (comparable to Zyrtec) – Deal. I have year round seasonal allergies and live on this stuff. Store brand Dairy Digestive Enzyme Supplement (comparable to Lactaid) – Deal. I’m an adventurous lactose intolerant foodie guaranteed to fall off the dairy wagon during the holidays. Cliff bars – same price. Husband likes to buy his energy bars by the box. 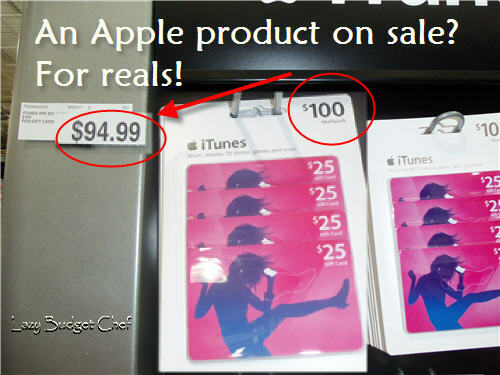 The price is the same at the stores we shop. If I had a manufacture’s coupon, I could get them for a bit less. BJ’s Wholesale Club is the only club that takes manufacturer’s coupons. Earth Yoga organic shirt and yoga pants – Deal. I paid $14.99 for a pair of organic Earth Yoga yoga pants and a shirt. The quality of the clothes is identical to regular Earth Yoga clothes the difference is they don’t cost $52.00 each. I bought a second pair! If it were close, I would have a membership to BJ's Warehouse Club because this type of warehouse club will save my small family money. I was surprised at the amount of ingredient type food BJ's sells which is most of what we buy. The sizes weren't overwhelming either. I might have taken advantge of the opportunity to buy things like the hummus since that is the amount I make when I make it but I forgot to bring the ice packs for my insulated shopping totes. Oops. What about you? Do you shop warehouse/wholesale clubs? What are your money saving tips? Disclosure: BJ's Wholesale Club invited me to a holiday blogger event. They provided me with a temporary guest membership and a gift card but I was under no obligation to use them or write about it. This did not influence my opinion because all opinions are 100% my own.